EVGA Precision for Windows 10 - A utility to enhance the capabilities of NVIDIA video accelerators. The application allows you to adjust the frequency parameters of the bus and the graphics core, change the values of voltages, the speed of rotation of the coolers, depending on the temperature characteristics. The utility is able to create custom settings profiles for fast switching of configured parameters. The program can display the video card operation indicators in any full-screen application or game, supports the assignment of key combinations, turns on the automatic mode for adjusting the speed characteristics of the fans. 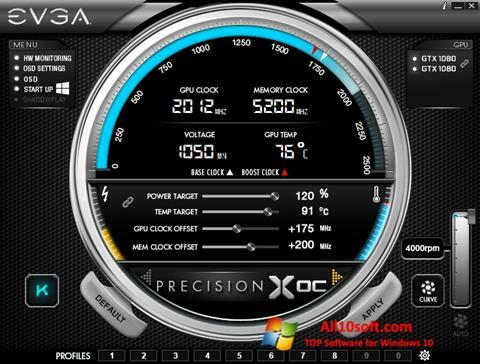 You can free download EVGA Precision official latest version for Windows 10 in English.